This garland has 14 little hearts attached to it. 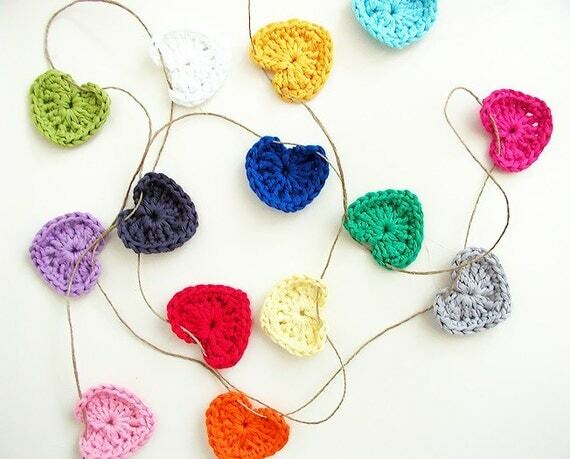 Move the hearts along the string to make the gaps between them as wide as you like.The total length of the string of the garland is approximately 3 meters. Every heart is 4.5 cm wide and high. The string of this garland has an off-white colour. If you prefer a red or a red/white string, just leave a note with your order. Folksy :: Buy "Trio of Crochet Hearts "
Folksy :: Buy "Flower Corsage - Red and white."